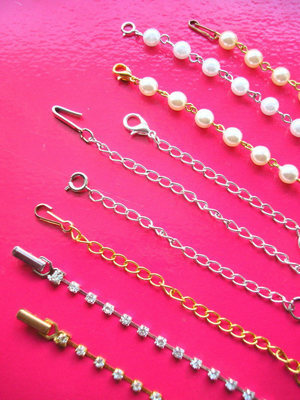 Fantastically useful handmade rhinestone necklace extender. Have you seen a rhinestone or diamante necklace that you like, but it's too short? Then this is the solution! This necklace extender is made from immensely sparkly, high quality close knit clear RHINESTONES claw set in silver or gold tone metal - the choice is yours. The extender comes in whatever length you require. Please choose colour and length from the dropdown menu. 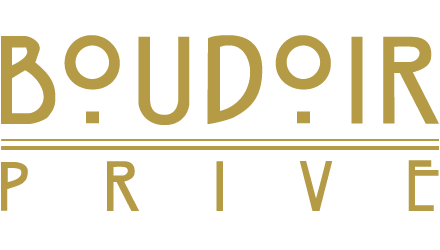 PLEASE NOTE: Length stated is total length, including end fasteners. If the length you require is not shown, then please choose the last option on the dropdown menu and leave me a note of your required length when ordering. 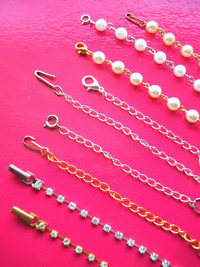 These extender chains are handmade by myself and are only suitable for use with necklaces which have folder over clasps. If you require an extender to suit a different type of necklace clasp, then please email me with the details and I will be happy to help. 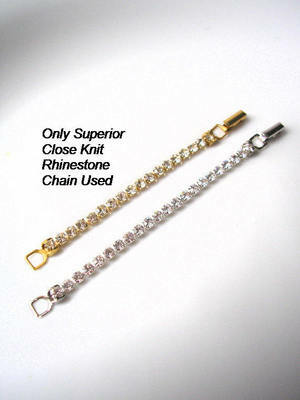 PLEASE NOTE:- These extender chains are made using 3mm rhinestones, which may differ from the size of rhinestones in your necklace. Other rhinestone sizes and colours are also available. Please email if required and I will make a custom order for you. Order that necklace with confidence, using this simple affordable solution!